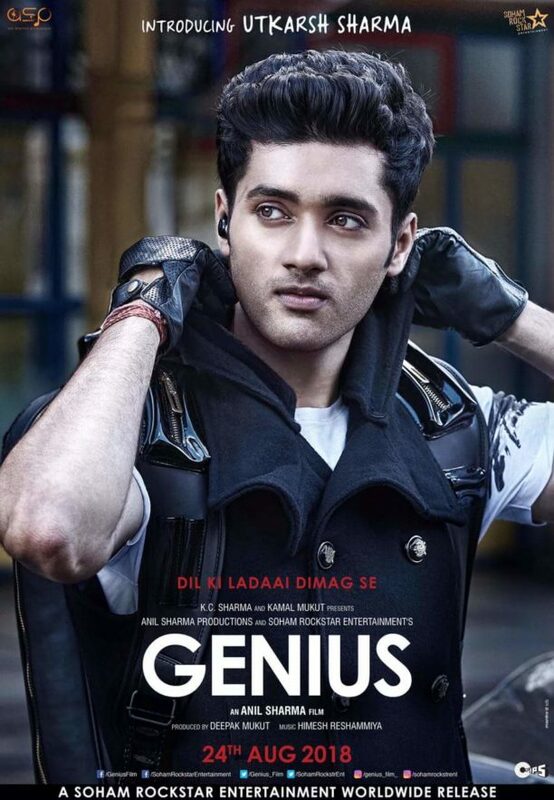 Film director Anil Sharma has been absent from Bollywood for some time (last directed Singh Saab the Great in 2013), but he has now returned with the film Genius – Dil Ki Ladaai Dimaag Se which will introduce his son Utkarsh Sharma as the lead actor. Famous for films such as Gadar – Ek Prem Katha and Apne, Anil Sharma’s Genius is set to be an action packed love story. The actress opposite Utkarsh is also a newcomer Ishita Chauhan. We have all seen Utkarsh as the little boy of Sunny Deol and Ameesha Patel in Gadar, and now that he is all grown up, we will get to see his Bollywood debut. Actors Mithun Chakraborty, Nawazuddin Siddiqui and Ayesha Jhulka will also star in the film. Genius will have music by the multi-talented Himesh Reshammiya and he is the sole composer of the soundtrack, which sees a move back to the tradition of one music director per soundtrack. Himesh also gave the music to Anil Sharma’s Apne which coincidentally released on the same day as Himesh’s debut film Aap Kaa Surroor the movie in 2007. Check out the first look of Genius below and also a short glimpse of the Holi song. The film is slated to release on 24th August 2018. 15 queries in 0.393 seconds.